Today’s story about wrong first impressions will be about Red City Radio, a some-kind-of-hyphen-punk band from OKC. I’ll admit I’m already behind on first listening to the band just last year – they formed in 2007. That said, I caught a solo acoustic set by lead vocalist Garrett Dale and then watched their last two or three songs as a group at Pre-Fest last year. My impression was that the band played soaring melodic punk along the lines of Iron Chic. It took about three seconds of their new EP, SkyTigers to admit my mistake. Maybe it was seeing 30 bands in 48 hours. Whatever that first impression was, it was wrong. Think something closer to Lucero, but without the ballads (or horns) and with a serious thing for arena rock grandeur. This is one of the more fully formed EPs I’ve heard in a while. It’s not a few in-betweener songs and it’s not a demo, but five cohesive tracks spanning about 20 minutes. It’s steadily emotional and poignant with a bit of 1970s arena rock build-up in each song and a flair for kitchen sink dramatic choruses. 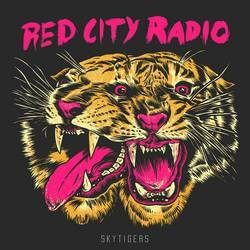 With SkyTigers Red City Radio could pass as any number of rock ‘n’ roll subgenres simply based on who they share a bill with. If it weren’t for the group vocals and the production in “Rebels,” this song could pass as country-pop. Normally I’d say that as a negative, but clearly production and nuance are what define music’s heart to me because it’s actually one of the record’s standouts. Much like the other four songs on the EP, my preference would be for a little less lead guitar and trimming 30-60 seconds to suit my own short attention span, but that all comes down to personal preference. The title track “Sky Tigers” might just sum it up best: “There’s a great big world out there that we can explore,” Dale sings over choppy guitars, a ba-ba-ba singalong and bells. It’s grandiose, positive, and forward-looking. It’s grown on me as I keep listening, but it’s ultimately more dramatic than I prefer. Posted Aug. 27, 2018, 10:17 p.m.
Posted Feb. 7, 2018, 8:20 a.m.
Posted Jan. 5, 2015, 10:31 p.m.